Good Morning. Here I am again starting my favorite blog at 5:50 am as we prepare to start debarkation. I admit to feeling very tired today this morning but I do have some adrenaline left from last night…………….oh……I mean the interview with John Cleese……….not Heidi saying it was Thursday.I think the cruise went well. The lost luggage was way down, there guests washed their hands and used the sanitizers and of course I got to meet some great bloggers. However, I must apologize as usual to Frank C, The Aussies, Jo and Dave, Karen, Debbie and Brad, Marlene, Ray and Mary, Leo and Marina and Karen……………bloggers who were so wonderful and who I did not get to spend time with as I would have wanted. I truly hope you all had a brilliant time and please let us know you arrived home safely. This is one of the reasons I am looking forward to the Bloggers cruise so I can indeed sit, relax and chat with as many of you as I can for as long as I want……….oh, congratulations to Mary Friedman a blogger who won the free cruise bingo………..congratulations. This cruise we expect just 2,989 guests with every cabin sold out. This means the count is lower because we will have just 2 guests in most of the cabins and the count of guests under 21 is just 29……………yep ……………29 kids ………that’s it, what a change from August…………..I will miss the kids corner though. Good news. We received 400 t-shirts and wristbands yesterday and this means that this cruise we will have our On the Deck for the Cure walk this cruise. Now all I have to do is find a time to do this which is perfect for everyone. I was thinking of a sea day but that might be a little busy for everyone. Then I thought of doing it as we leave Venice but then I know everyone likes to look at the sights as we leave and we already have the Mask Sailaway Party. Early mornings are not going to work as so many people sleep in after long days in port so I am thinking of a 4 pm afternoon walk on the second sea day. I just want this to be totally perfect……………I will keep you posted. 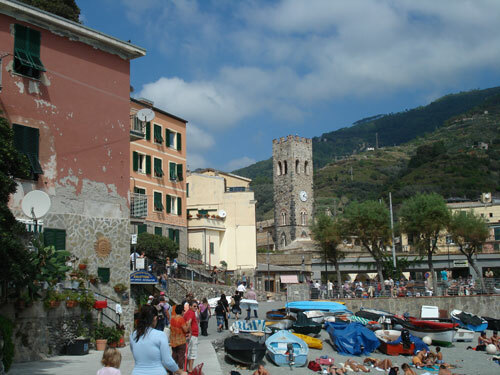 Here are some photos continuing the theme of our new tour to the “Five Villages” in Livorno………………….beautiful. 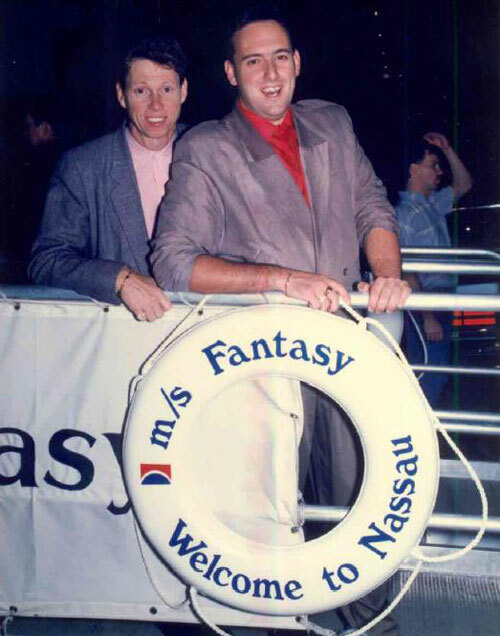 And before the Q and A section a photo of myself and Gary Hunter, my mentor and Carnival’s greatest ever Cruise Director taken on the Carnival Fantasy in 1990. Let’s get on with the Q and A with the last few from Nesurn Dorma and then as many as possible from the blog called its A Kind Of Magic. ANDREAS GOEDDE – Goodness me, I have a feeling there must be a few shopkeepers throughout the Mediterranean who truly must love you. 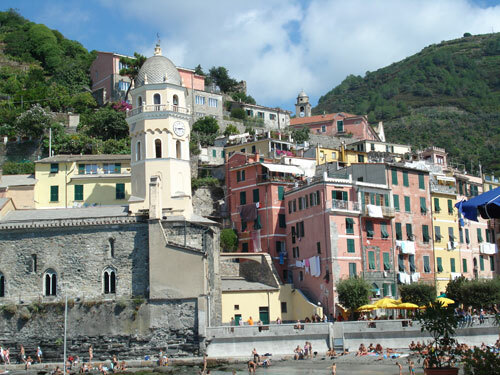 Your garden sounds amazing and with the new additions from Barcelona and Tuscany I am sure provide you with constant memories of your cruise ………..even if you have never been to Mexico. There is some great shopping in the Baltic………..bring your wallet. All the best. PAUL F. PIETRANGELO – Hello Paul and as always it is a sincere pleasure to hear from you. My sister got the looks of my Mum and I got the looks of my Uncle Harold………go figure. I am glad you enjoyed the sunset photos and Heidi took some more yesterday and we will slap those on in the next few days. As for my eventual retirement, I have no idea but I do hope Carnival will offer me something……….maybe I can just keep blogging forever? Most importantly I want to thank you for your kind words about Pavarotti. He was a genius and we will never forget him. I hope you are well and as always Heidi and I send our warmest regards to you and your family. GREG BALDASARRI – As it saddens you to hear that I may one day retire from being a Cruise Director, it saddens me Greg. I love this job but I have to realise that one day soon it will be time to live in a house, raise a family and live a somewhat normal life. I don’t know when that day will be but it may come toward the end of next year, we shall see. Hopefully I have something to offer ashore but that of course is not my call. Having spoken to John Cleese in length his wit and charm were obvious from the start and I am so looking forward to sharing the entire interview with you all soon. Thank you for asking about Chrissy and Brad. I did hear from them on Friday and they are in the process of taking care of family affairs following the funeral. They said they would be posting a thank you statement very soon. Thank you for your kind words of support and you will have to put up with me for sometime to come yet. Cheers mate. CRUISIN SUE – Like your experience on the Mardi Gras it will be sad to say goodbye to the Celebration. I have some amazing memories of my time on their as a Wine Steward. Still, she is not gone forever and will remain in the family and will just be sailing with a slight Spanish accent. You will be here soon, is there anything I can help you with before you sail? Thank you for the wonderful posting and I hope your cruise in October will provide you with the same feeling as you had on the Mardi Gras all those years ago. KATHY KROLL – I will be sending Mary Hyder a welcome photo and gift from you and Lee Laul . Cheers. BILL – ZYDECOCRUISER – How was the cruise mate? I hope you got the stuff I sent you and thanks for posting the photos. Welcome back. BRYAN – Your contribution was most welcome, especially the comments about Heidi’s photos as she appreciates the recognition of her photo skills. I hope all is well with you and your family and I look forward to hearing from you again soon. RUTH JAMISON – It appears Heidi’s photos are very popular so she is happy to hear that. The future is bright I am sure but I am beginning to realise that I need to start thinking about what Heidi and I need to do. I hope Carnival will have something for me ashore but we shall see. I could do this job forever but I know that it will be time to settle the roots down soon……….but not just yet. Thank you for your words of confidence, they mean the world to me. Wishing you a wonderful day and please keep reading the blog thingy. RB GATES – Your wish is my command. I will indeed be interviewing our Chef soon as you requested. Did you see the interview with Cyrus Marfatia who is in charge of the Food and beverage Department fleetwide? Just pop his name in the search thingy and have a read. Food is very important to me as well so I shall enjoy the interview with our Chef as I hope will you. It will be ready very soon. Thank you for your support of the blog thingy. VIKKI AND MATT TILL – I was not going to comment on the fact that the McCanns have been named as suspects in the case of their missing daughter Madeline. I am a great believer in the fact that people are innocent until proven guilty and I am sure that they had nothing to do with this terrible situation. I have watched all of their interviews and I cannot believe that they are involved in this awful case…………….I hope I am correct. You are right to highlight this as the search for her must continue and maybe just maybe one of our international bloggers may see her somewhere………….let’s pray that this happens soon. You can vent anytime you want Vikki….I will be here to listen. MELANIE AND DAVE – There will be more sunsets on the way….pour yourself a glass of wine and enjoy them…..see you in January. PEGGY P – Your husband and I have a lot in common. Heidi takes photos wherever we go, all the time and hundreds of the things. This sometimes drives me crazy although I must admit the ones of the sunsets she took last week were spectacular. Costa Maya has started their rebuilding program and I hope things will get back to normal but I fear this will take a long time. Please continue to enjoy the blog and my best to you and your retired Navy man. LINDA HERNACKI – How are you both? Well, you mentioned 2010 and me being a CD in the Caribbean………wow, that seems a long way away and I have no idea if indeed I will be onboard ships then…………probably not built we shall see. I am sure regardless of if I am there or not that Joshua’s first cruise will be a special time for the entire family. I have had a thought about the dressing down thing but I just cannot come out on stage wearing a pair of jeans. I have only had one guest say I overdress and although I have no concerns about the way I look normally I do think that guests prefer their CD’s to look smart so for ma that’s a suit or blazer………maybe I will have one night where I dress down……..lets see. Hope Mike is having fun looking for Paris and my best to you both from your great friends here on the Carnival Freedom. KERSPLOTT – I am so sorry to hear about the terrible accident when a tub of Sticky Toffee Pudding ice cream fell into your shopping cart, I hope nobody was injured. 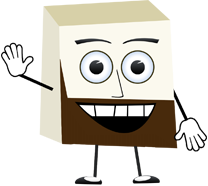 Your vote for an Alaskan Bloggers Cruise for 2008/2009 has been cast so we shall see what happens………..it is certainly a place Heidi and I (or is it me and Heidi?) want to see one day. The Pavarotti concert was and will continue to be a highlight so his memory will live on here on the Carnival Freedom. Hope all is well and our best to you both as always. OCEAN ANGEL – Thank you for your comments on the Singles Board. 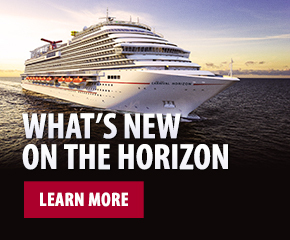 We are going to try it this cruise and it will be closely monitored by the staff. I will report on its progress as the cruise continues. I wish you could have seen the Pavarotti Concert. It was one of those special moments. Thank you for reading the blog thingy. LFTTNSFCF – a very happy belated birthday mate ……..39 again? I have chosen lots of great movies for you all on the crossing including daily matinee 2 pm movies which you will enjoy drinking a hot chocolate while wrapped up in a big heavy duvet. Some of the titles we have are. Those are just some………….the rest are a surprise. It sounds like you really need this nearly smoke free cruise and of course there will be a Bloggers get together………..in a smoke free bar of course. My best to you and the Mrs. and once again……….happy birthday. RUS AND NINA FRANKLIN – The crest was amazing, fantastic, stunning and summed up all the things I love about life, AJ, CZJ, JELLY BEANS AND ASTON MARTINS. Thank you also for the Benjamin Franklin quotes “FART PROUDLY” which my Dad enjoyed and now has posted in his office at home. You are both fun people whom I hope to meet very soon. MRS. MTSFP – Goodness you must have tired fingers after that long posting. Your posting mentioned all my favorite programs and I forgot As Time Goes By with the wonderful Dame Judy Dench seems PBS in America are great supporters of the Brit Sitcom and Dramas and that includes one of my all time favorites, All Creatures Great and Small. These books by James Herriot was turned into a long running show featuring the wonderful British actors Robert Hardy and Christopher Timothy. Robert Hardy also starred as Winston Churchill in a wonderful biography series………..it was brilliant. Your postings are unique and we all appreciate them so very much ……….keep them coming please. TERRI 910 – And more great programs as mentioned by you Terri, especially Yes Prime Minister………what a classic. I have a feeling you will enjoy the interview with Mr. Cleese………it was a very special moment for me. Thanks Terri for your constant support of the blog. 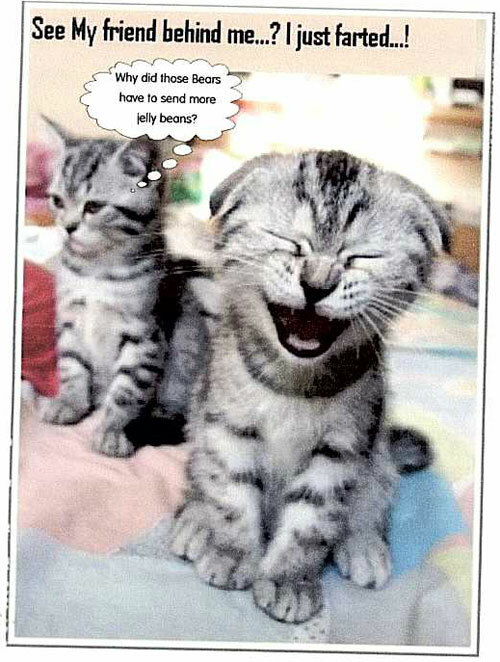 THE BEARS, CARL AND BARB – Today, I received your care package and what can I say………..more Jelly Beans for the jet pack and, of course, the gifts for Heidi were so gracious, you are too kind. Kevin and Caruso are brilliant performers and I am glad you enjoyed their show. The entertainment on the bloggers cruise will be spectacular…………..I promise. Most importantly, how are you Barb? 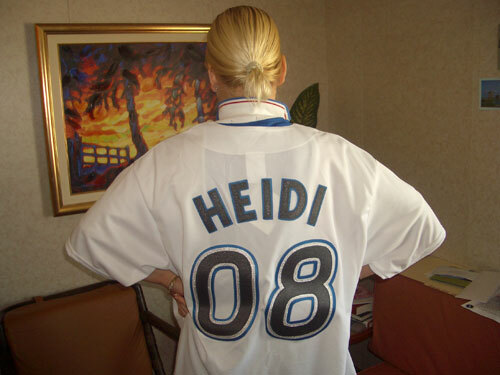 Heidi and I think of you all the time and please let us know how you are doing ……..you are in our thoughts. KEVIN – Oh no, the Aston was in an accident? I have written some sad things on this blog and here is another. I cannot believe that your beautiful Aston Martin has been totaled. I can only imagine how you must feel and I have no idea what I can say to you to make you feel better. I know the car is only a thing but it is a beautiful thing. Anyway, at least you were not hurt and now you have the decision of what to spend the insurance money on. Will you get another one? How about a DB9? I am thinking of you tonight and I guess me and you in the Aston was never meant to be. I hope the restaurant where you valet parked will give you a few free meals. Thinking of you mate and think of me a little bit as you are the only person I know with an Aston Martin. 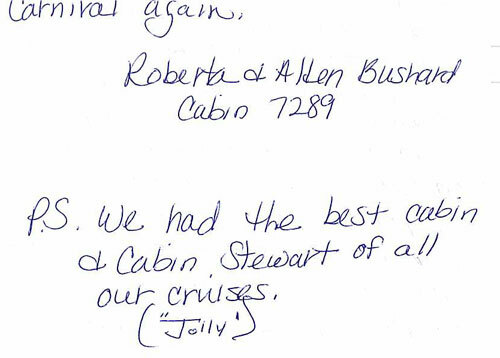 CANUCK CRUISER – Thank you for leaving a little note for Todd when you arrive to the Carnival Liberty. 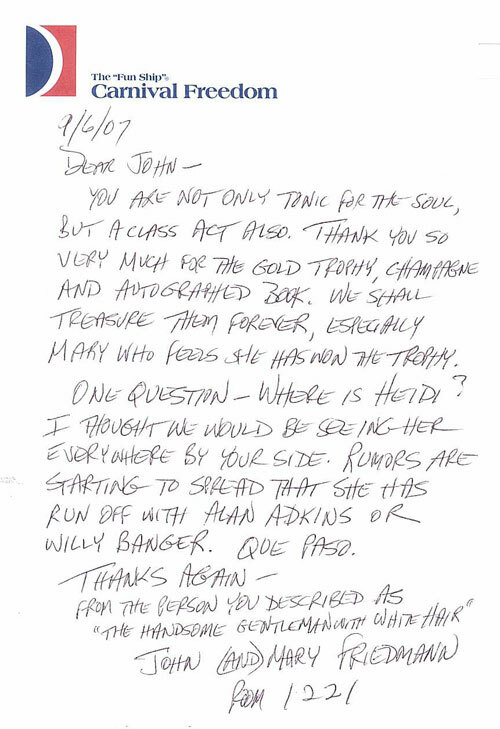 You might want to mention that I promised you a bottle of champagne and a solid gold plastic trophy (wink wink). It’s funny that my idea of wearing casual clothes on stage has produced such opinion but for now, I am going to stick to what I know best, blazer and or suit. You will not be disappointed with the John Cleese interview, it was like talking to Basil, Archie and a host of Monty Python characters, it was a true highlight of my life. Thanks for your support of the blog, talk to you soon. INEZ – I have forwarded your e-mail to Alex, hopefully you will receive an answer soon. 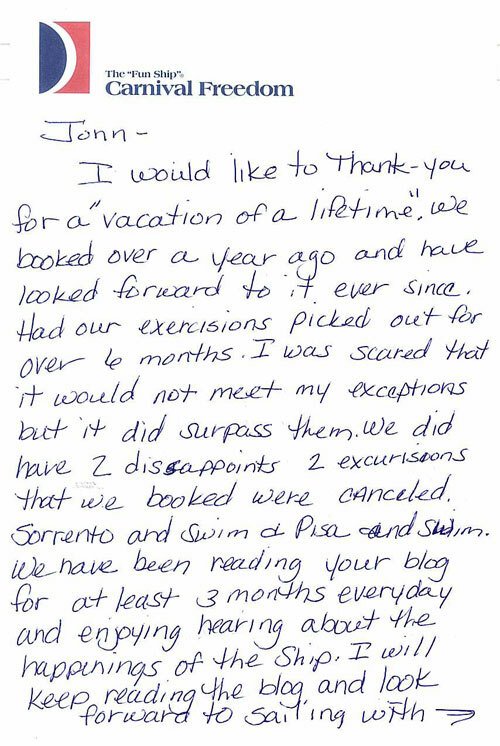 Thank you for sharing your wonderful restaurant story and especially for singing the praises of Carnival Cruise Lines. You have no idea what words like that mean and I have forwarded your comments to Chris Prideaux in our office for him to read. I am sure he will be proud of all the Cruise Directors, my best to Dean and I look forward to your next posting thing. JENNIFER HAMMOND – We will keep Pavarotti’s flame burning here on the Carnival Freedom and I am sure the guests this cruise will enjoy hearing his amazing voice as we sail into Venice. I hope you enjoyed sailing with Michael Mullane, we all miss him here very much. Thank you Jennifer, hope all is well with you. PEANUTS – It’s a bet. I wish I had a Miami Heat shirt, if I did I would take a photo and slap it on the blog. Good luck to your WNBA team. I hope the girls do well. Thanks mate, this should be fun. MICHAEL & KELLY – What a beautiful posting and after everything you wrote, I want to mention the words “We think of you both as friends.” After reading your wonderful words the feeling is mutual. I am glad the blog is providing you with lots of laughter and I certainly have tried to make the blog as diverse as possible. How fantastic that you met Michael while working at Disney Land. I can only imagine the wonderful stories both humorous and uplifting that you could share. If time allows maybe you could slap one or two more on the blog for everyone to read. Tell Michael this for me. “And the number shall be three, not four and not two, five is right out” and then tell him “What are you going to do, bleed on me?” I hope he enjoys the John Cleese interview as much as I enjoyed reading your posting. All the best from us both and we look forward to the start of a great friendship. LISA AND ELAINE – I hope the flu hasn’t got you feeling too down. Stay in bed and get some rest. When my dad has the flu, my mum always makes him drink a blended cocktail of peas, Brussels sprouts, a raw egg and a drop of Cognac. It’s an old Scottish recipe that tastes disgusting but always does the trick. Thank you for your kind words and I agree for now, a suit is the way to go and thank you also for your nice words for Pavarotti, we shall always remember him. Feel better, we are thinking about you. 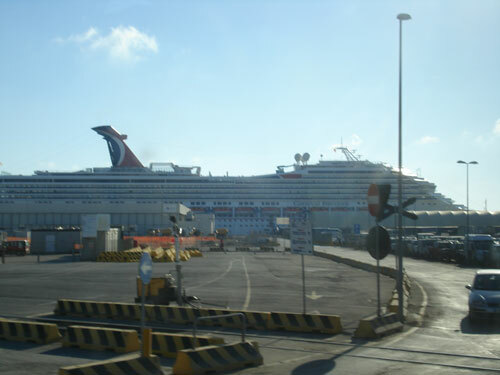 GREG BALDASARRI – I can assure and promise everyone that the photo of the Carnival Triumph heading toward Canada from New York in the rough seas is real. I was on board and stood on the bridge with Captain Salvatore Rassello and watched the wind gauge peak at 80 knots. I also remember the Canadian Coast Guard plane that flew above us taking the photos as we headed towards Nova Scotia. It was a day at sea I will never forget and the picture is as real as it gets. Thanks mate and by the way, what is Photoshop? ROB ROLAND – I also am so impressed with the crest which has been updated as you said with AJ and CZJ as well as an Aston Martin logo. How about that. I have asked Heidi if she would consider having a tattoo of my crest on her …….and that’s as far as I got before room temperature dropped 60 degrees and I found myself with the Spaniels and the Poodles. Thanks mate. MYRA BUSHNELL – I am glad that as a magic fan you enjoyed the interview with Kevin. It would be easy to put them on the bloggers cruise, however, shipping all their huge illusions for one cruise only is not possible, which is a shame. You will however not be disappointed with the entertainment. I do feel like John Cleese and I struck up an accord and if it continues then indeed I will ask him to come on future cruises. As I just wrote to Greg, the Carnival Triumph was heading to Canada away from a hurricane when we caught the tail end of the high winds unexpectedly. There was no damage to the ship, nobody was hurt but it was not a good day to be a paper bag. Looking forward to seeing your crest and thank you for being such a wonderful supporter of the blog thingy. RIKKI BOYCE – We are going to give the message board a try and we will see how it is going. Handling guests who complain is an art but at the end of the day you always look upon a complaint as a gift and just listening sometimes is enough……..Not always, but sometimes. On the TA cruise we will have lots of entertainers join in Portugal, the last port and they will stay with us until we arrive into Florida. We are one act short, so if you would like to belly dance, you are hired. I hope I get to hear you and Bill sing at karaoke and as for my other heroes, I will list those at the bottom of this blog-thingy. Looking forward to seeing you soon. BIG ED – Kevin is a magician, not a miracle worker. Making you and I disappear would require the largest trap door in history. I am really looking forward to enjoying some great social time with you; however, knowing me I will still be dressed in my suit. Your blog is looking fantastic and I appreciate it. Please can you possible write a little note to my friend Alan? He is a big fan and would appreciate a personal message. GLORIA – No dressing down for me, it’s hard to teach an old dog new tricks. I am glad you are still enjoying the blog and I enjoyed your posting today. It made me laugh. GIRL DOC – I am going to give the board a go and let’s see what happens. Kevin and Caruso are fly on entertainers and we have all their equipment on board and all they do is fly in to a port, do the show and leave the following day. What a life. I also have not heard from J Toddinman for a few days and also Nanci Nurse. Where are you?? As far as South America is concerned, I should know toward the end of the year what I will be doing and will let everybody know. Thank you doc and all the best. SEWING NUT – How are you? Let me start by answering your questions. I wish we could have a biggest splash down the waterslide contest; however, the ladies and gentlemen of our Health and Safety dept. raised a huge red flag with the word NO on it. So that was that. I will send a link to you with your son’s picture that he drew on the next blog thingy. How is he by the way? Please give him my best regards. We miss you here, especially Heidi. See you next time. MAXINE – I promise you, no casual shorts and polos for me. And your kind words have made sure I stay the way I am. Thank you. KATHY HADOULIS – Has it been 4 months since the Mellow Yellows cruised? Where has the time gone? You made me laugh by saying you are a “Healdhead”…….this is a new word and maybe one that will take off. You asked about George the Greek who is indeed still proudly working after all these years and is currently on board the Carnival Inspiration. I hope you and all the Mellow Yellows are well and thank you for checking in on us here at the blog-thingy. LEASA – I hope you like the interview with John Cleese. It was a wonderful chance to talk to the great man and I enjoyed every minute of it. All the best to you. RP – What was your cabin number and what did you leave behind? Let me know ASAP. THE PLAZ – It would have been fun to have put the people who wanted a balcony on deck 2 on the Carnival Triumph during the bad weather showing in the photo. There is indeed open balcony public spaces at the front of the vessel on decks 6, 7 and 9, which rarely get used, but offer wonderful views. Hope all is well with you mate and it’s always great to hear from you. MRS. MTSFP – I think deep down you are a huge Python fan and you mentioned all my favorites. My overall favorite was the Ministry of Silly Walks and of course the Dead Parrot sketch……….Classics forever. LEZLEE – The tribute for Pavarotti was amazing and it will continue as long as I am Cruise Director on this ship. On the Sept. 22 sailing the formal nights are on September 24 and October 1. The Past Guest Party will be on September 26 at 5 pm and 7:15pm. In case I don’t speak to you before, have a safe flight, see you soon. MATT AND VIkKI TILL – Transporting Cuban cigar into the U.S. is still illegal. The only thing I can tell you that other people do is to take the bands off the cigar and have them loose in a box that is not Cuban. I cannot tell you to do this but I know thousands of people who do this every day. It is a shame that you were fined and the fine was probably more than the cigar was worth. Try Arturo Fuente Opus X and Ashton Special Edition Dominican cigars. They are excellent this year. My apologies to MTSFP and MFSTPBLFTTNSMCF. Hope you are both well and I hopefully one day will get to smoke a cigar with you. That’s all the Q and A for today, we will continue tomorrow of course. There will be no interview today as I have been working on the John Cleese thing to get it down and up loaded in or on or something or other ready for tomorrow. The interviews will return soon and this week we have some more special surprises for you. Here are some follow-ups from Roger Blum to questions asked over the last few blog thingies. Deck plans on the internet – they are there on Carnival.com. There is a link. On the top of the page, click FUN SHIPS, then on the next page, on the right hand side, there is a list of all of the ships. Once you click on a specific ship, there is a link that says DECK PLANS. By the way, maybe PA 007 can correct me if I’m wrong, but you listed some Cunard ships that have been named by British royalty. Carnival’s second ship, the CARNIVALE was originally named by Her Majesty the Queen when she was launched as the EMPRESS OF BRITAIN, and then named by the Queen of Greece when she was renamed the QUEEN ANNA MARIA. I believe she is the only ship in history that was named by two different reigning monarchs. Thanks Roger…………by the way Roger has the largest Polo shirt collection in Florida! Can I also say hello to the following people who sent Heidi and I gifts which we received today. NANCY BRIGHTBIL AND FAMILY – Thank you for the gifts and I especially loved the Old Bay seasoning……..mmmm. SUSAN ( KERSPLOTT ) – Thank you for the fantastic card and photo of the Carnival Spirit. How wonderful to live in Alaska. The singing card was terrific. CARL AND BARB THE BEARS – I want to say a HUGE thank you for the 7 bags of Jelly Beans. My tank is now full and should remain so for a long time…………….although a man can never have enough. The card was beautiful and funny as the readers will see below. KELLIE O’LEARY – WOW. 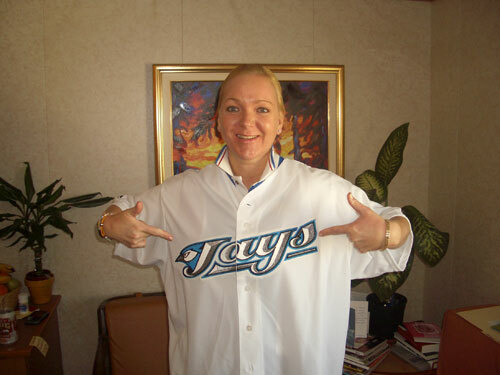 Thank you for the Toronto Blue Jays jerseys and other wonderful gifts. I am now a HUGE Blue Jays fan……………until someone sends me a Jersey from their team 🙂 You are very, very kind. CAROL SCHOENBERGER – As your card sang to us “Thank you very much” so Heidi and I sing the same back to you for the card and the wonderful gifts…………you are too much………….thank you. 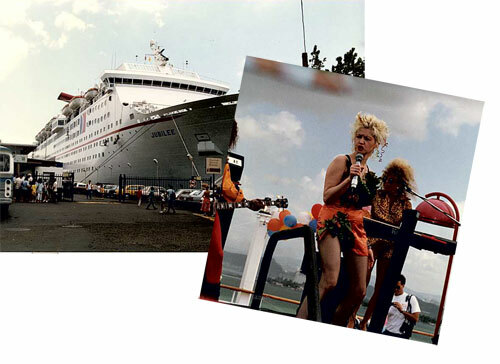 Have a look at this photo that Carol sent of the Jubilee and the performance of Cyndi Lauper…………I was a social host then. There is also proof here as to why I will never host the Male Nightgown Contest. RANDY – Thank you for the LA LAKERS MUG. This is the first NBA mug I have ever received and although my friend who is a Heat fan will not be happy, I had a cup of coffee from it already. Thank mate. PAUL SCOTT – Heidi says a HUGE thank you for the Starbucks Mug from Chicago. She loves MUGS and especially Starbucks ones and this is her first from the U.S.A…………thank so much. 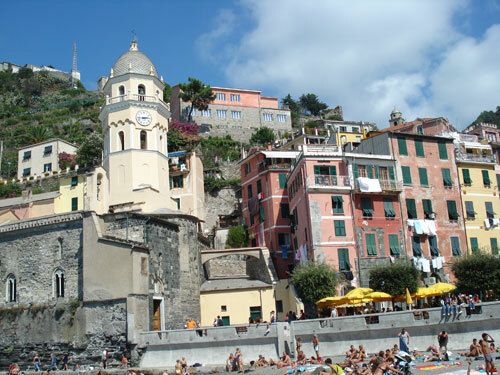 So, the guests are boarding and in an hour I will be hosting my travel and adventure talk for Naples as well as the usual orientation information. As I mentioned we have very few children and only 2,900 guests……….should be a good 12 days. We also have 500 people from the KZST RADIO GROUP in California as well as a Japanese Film Crew who are here making a documentary and will be filming me at work……………I play the part of Godzilla. I mentioned earlier that interviewing John Cleese fulfilled my desire to meet one of my seven idols from the world of entertainment. Someone wanted to know the rest so here they are. RICKY GERVAIS…………….WRITER OF THE SERIES “THE OFFICE” AND PROBABLY THE MOST BRILLIANT OF TODAY’S NEW GENERATION OF COMEDIANS AND WRITERS. ANDY McNAB……………BRITISH SOLDIER AND ADVENTURER AND NOW BEST SELLING AUTHOR. DAVID LETTERMAN……….THERE IS SOMETHING THAT HE HAS, I DON’T KNOW WHAT IT IS BUT HE REALLY HAS THE AUDIENCE IN THE PALM OF HIS HAND FROM MINUTE ONE. So, there you have my list. I have met one. He is probably the only one I will ever meet but never say never. Who would have thought that I would have just spent 45 minutes on the phone with John Cleese? Off to do the talk, back soon to wrap things up. And here I am…………did you miss me ? The talk went well ……………….except ………………oh my goodness. There is nothing like being on stage for only ten minutes and in full flow about the ships itinerary when a voice from above calls…….. I carried on with the talk. If it had been later in the cruise maybe I would have more fun with it but I needed people to get to know me first. So I carried on……..the next bit beggers belief………but I have 1,600 witnesses.